STATE CAPITOL, PHOENIX –Arizona House Minority Leader Chad Campbell, D-Phoenix (District 24), today released the following statement calling for Maricopa County Sheriff Joe Arpaio to resign. A federal judge recently found that the Maricopa County Sheriff’s Office engaged in the illegal practice of racial profiling. “A federal judge determined that the Maricopa County Sheriff’s Office, under the direction of Sheriff Arpaio, illegally profiled Arizonans based on race. The judge ruled that a top law enforcement official in the county violated the law. This decision left no room for ambiguity. It’s time for Arpaio to resign. “The sheriff has indicated that he intends to appeal the judge’s decision. If he pursues this course of action, the sheriff will waste additional tax payer money and will bring unwanted attention to our state for what will amount to little more than political posturing. The bottom line is that racial profiling is an indication of the culture of corruption the sheriff has created. Such practices are both extremist and divisive. STATE CAPITOL, PHOENIX – Rep. Debbie McCune Davis, D-Phoenix (District 30), will host a public forum to review the results of the investigation into the Arizona National Guard. What: A public forum to discuss the results of an investigation into the accusations of misconduct in the Arizona National Guard.All legislators are invited. Presenters will include Robert White and public comments are welcome. 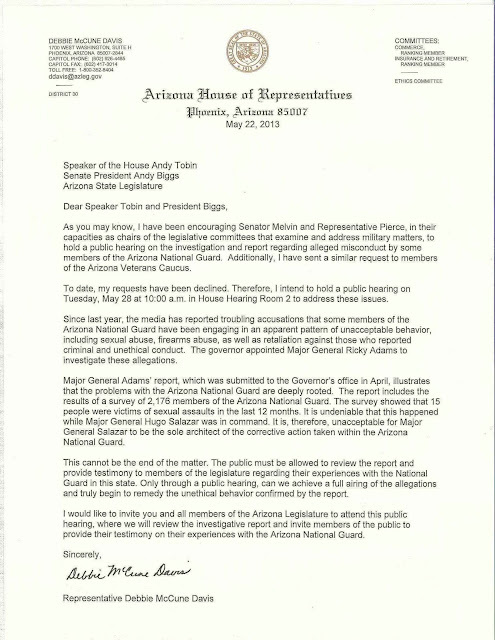 STATE CAPITOL, PHOENIX – After reviewing a report from the National Guard Bureau confirming shocking incidents of misconduct within the Arizona National Guard, Rep. Debbie McCune Davis, D-Phoenix (District 30), is renewing her call for a public hearing to review the report’s findings. McCune Davis said the report, which was submitted to the governor’s office in April, illustrates that the problems with the Arizona National Guard are deeply rooted. She said the report includes the results of a survey of 2,176 members of the Arizona National Guard. The survey showed that 15 people were victims of sexual assaults in the last 12 months. It is undeniable that this happened while Maj. Gen. Hugo Salazar was in command. She added that the report indicated that when victims did come forward to report mistreatment or crimes, they were sometimes told to be more resilient or to be tougher and complain less. She noted that the Guard’s adjutant general, Maj. Gen. Salazar, has been in command since 2008. 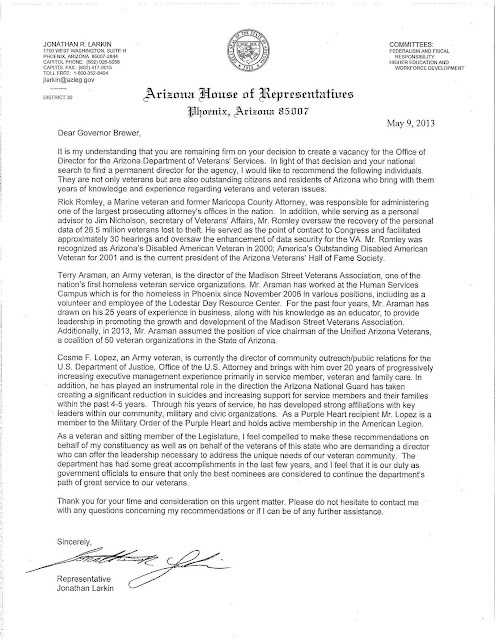 Today McCune Davis again called on Sen. Al Melvin, R-Tucson (District 11), chairman of the Senate Commerce, Energy and Military Committee, and Rep. Justin Pierce, R-Mesa (District 25), chairman of the House Public Safety, Military and Regulatory Affairs Committee, to conduct a public hearing on the Arizona National Guard report. 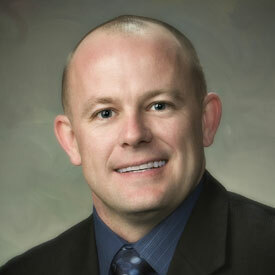 STATE CAPITOL, PHOENIX – Rep. Jonathan Larkin, D-Glendale (District 30), today respectfully requested that Gov. 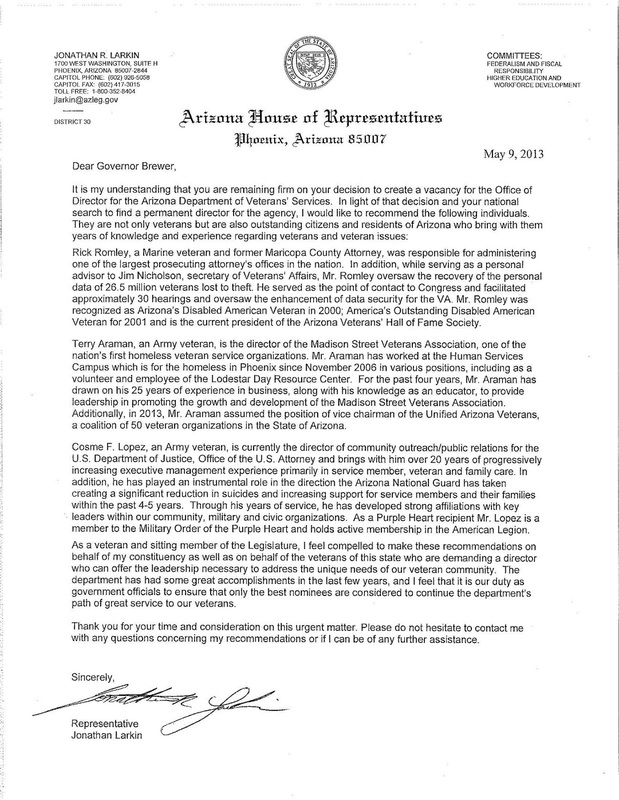 Brewer consider his recommendations to fill the director’s position at the Arizona Department of Veterans’ Services. STATE CAPITOL, PHOENIX – The House of Representatives recently approved a bill co-sponsored by Rep. Lela Alston, D-Phoenix (District 24), that would create educational benefits for some young adults who have aged out of Arizona’s foster care system. Alston said SB 1208 would create a five-year pilot program to help qualified students, who were previously in foster care, attend Arizona public universities and community colleges by instituting a tuition waiver scholarship. SB 1208 requires students who qualify for the tuition waiver pilot program to apply for federal tuition assistance, reducing the amount Arizona would need to provide. All recipients of the tuition waiver must perform at least 30 hours of community service each semester. According to a Pew Charitable Trust report, nationally one in four foster youth are incarcerated within two years of aging out of foster care. Only half of those youth will graduate high school, and of those who do, less than 3 percent ever earn a college degree. On Wednesday, the Arizona House of Representative voted 49 to 9 to pass the bill. It now goes back to the Senate. For more information on the Pew Charitable Trust report, go to http://www.pewtrusts.org/news_room_detail.aspx?id=26136. STATE CAPITOL, PHOENIX – House Minority Leader Chad Campbell, D-Phoenix (District 24), said he is skeptical of any ethics reform calls from Republicans at the Arizona Legislature. In the current legislative session, Campbell introduced HB 2256 to correct the concerns raised by Maricopa County Attorney Bill Montgomery following his investigation into the Fiesta Bowl scandal. Montgomery identified several problems with the laws regulating lobbyists and financial disclosure for public officials. Campbell’s bill sought to fix those problems and to provide more accountability and transparency to the public as well as to diminish the influence of lobbyists. This bill includes reforms that make it a criminal offense to recklessly file false financial disclosure forms and closes all of the lobbyist gift ban loopholes. In the 2012 legislative session, Campbell introduced the same provisions in HB 2704. A news report regarding the Republican-led Legislature’s unwillingness to address ethics reform recently aired on KTVK-3TV. 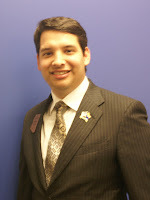 To see the report, go to http://www.azfamily.com/video/featured-videos/Monday-night-at-9-Gifts-for-lawmakers-206050641.html. STATE CAPITOL, PHOENIX – Rep. Albert Hale, D-St. Michaels (District 7), recently accepted an appointment to serve on the National Conference of State Legislatures’ Nuclear Legislative Workgroup. The NCSL’s Nuclear Legislative Workgroup provides legislative members the opportunity to learn how nuclear operations and energy issues affect the nation. Members of the workgroup help guide policies and advocate on behalf of individual states. In the late 1970s, Hale along with United States Senator Tom Udall, former Secretary of the Interior Stewart Udall and former Ambassador William Mahoney, Sr. litigated against the United States on behalf of Navajo uranium miners. The litigation requested compensation for injuries resulting from exposure to uranium radiation while working in uranium mines in the Four Corners area. The litigation eventually resulted in the Uranium Miners Compensation Act enacted by the United States Congress to provide compensation to Navajo miners and others for radiation exposure injuries. From his work, Hale has extensive knowledge of the legacy of open uranium mines and tailings left in the Four Corners region of the Navajo Nation. The workgroup will convene June 4-6 in Cincinnati, Ohio and will include an overview of federal nuclear regulatory programs. Members will tour the Portsmouth Gaseous Diffusion Plant that enriched uranium for weapons during the Cold War and a facility with a new centrifuge plant.